Trickling streams of melting snow flow through our barren yard. The robins sing morning love songs to announce their arrival. And the sun is still shining when I begin making dinner. Yes, spring is near in the Midwest. But as one might guess, spring produce is not. Wawa…. the ground still too cold and wet for planting. So we make do with what we have, and hold onto fruits and vegetables that are easily accessible during this in-between time. 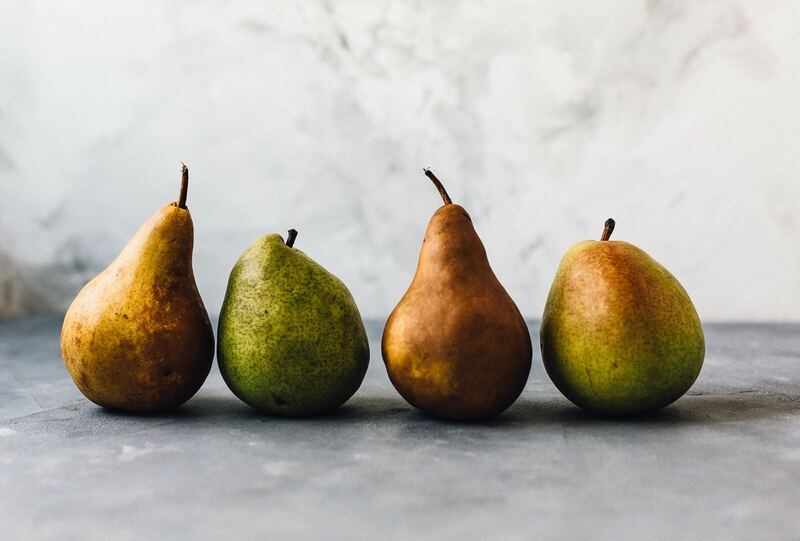 Like USA pears (grown in Oregon and Washington where the right mix of volcanic soil, clean mountain water, and warm days with cool nights, combine to produce perfect pears), the sponsor of this post! And red onions. And cheese. 😉Okay, halloumi cheese isn’t produce, but it IS good any time of year. I used two different varieties of pears in this caramelized dish, the green Anjou (in season from September to July) and Bosc variety (September to April). 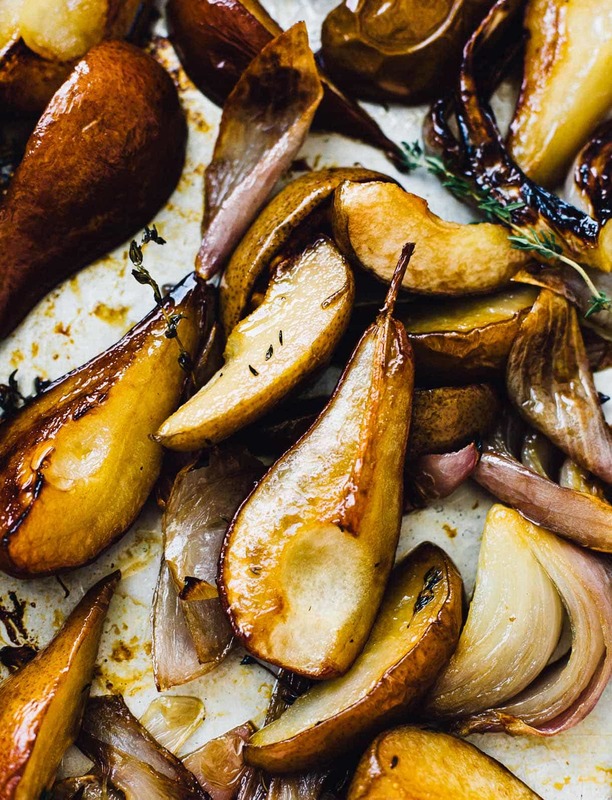 Reason being that the two are a little firmer in texture, which I knew would bode well for baking, and in the middle of the pear sweetness range – ideal for a savory dish while still getting some good caramelization. You’ll cut the pears into quarters, and then once more. 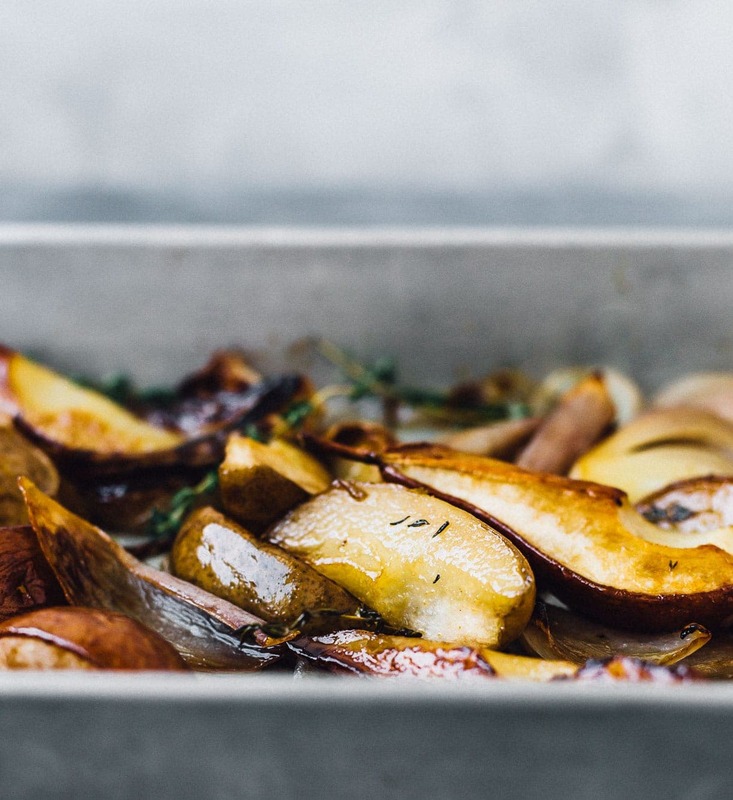 Into a baking pan they go, with wedges of red onion, olive oil, and thyme sprigs. 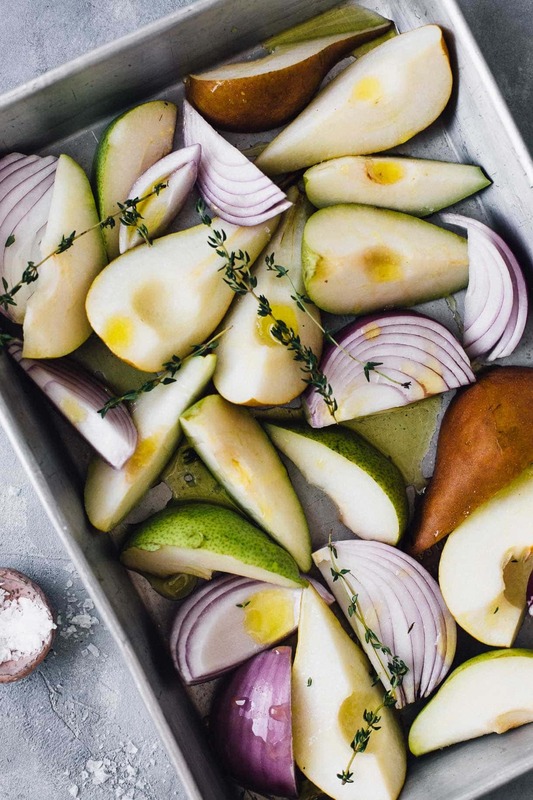 As they bake, the natural sugars from both the pears and onion are released, and leads to browning – the key to lots of deep flavor. 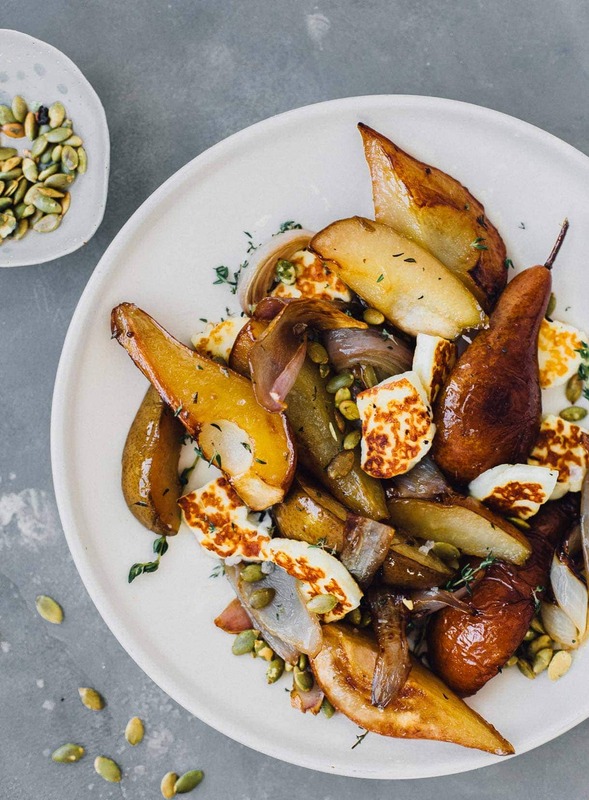 One other benefit of roasting is that if you didn’t quite let your pears fully ripen, they’ll still turn out beautifully in this recipe because the heat will soften them and bring out their gusto. *note: I leave the skins on because they contain the majority of the fiber found in pears, a leading fruit source of this nutritional component. A medium-sized pear packs 6 grams of fiber, which equals about 24% of the recommended daily value! This side dish has it all. Savory, salty, and sweet. Creamy with a little bit of crunch from toasted pepita seeds. 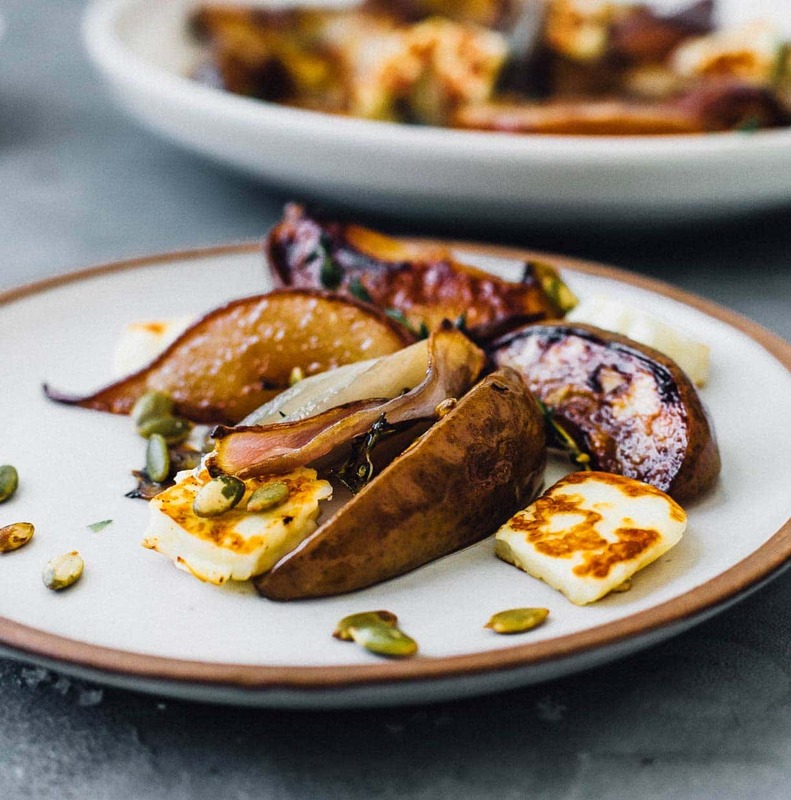 If you make these Baked Pears with Halloumi Cheese, tag me on instagram with hashtag #heartbeetkitchen or @heartbeetkitchen! Take pear halves and cut vertically into quarters. If they are quite large, halve again vertically. Place in a 9x13 baking pan, along with the wedges of red onion. Add thyme, and sprinkle salt over everything. Pour olive oil and maple syrup over everything, and gently toss with hands to coat all. Bake for 25 minutes, then turn ingredients over. Bake for another 20 minutes, until ingredients are browned and caramelized. Remove from oven, and discard thyme sprigs. Heat a non-stick skillet to medium high. Add slices of halloumi and cook for 1-2 minutes on each side, until browned and soft. 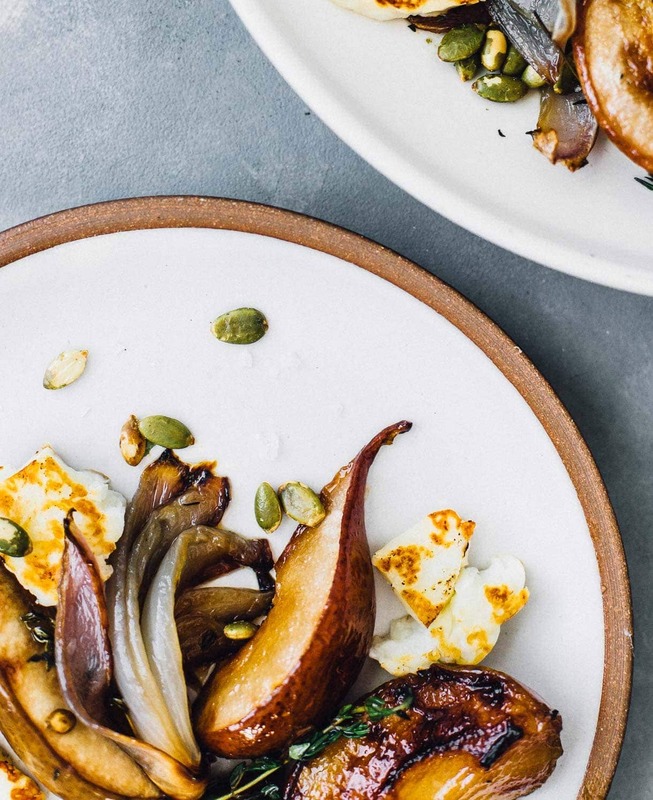 Add halloumi to pan and toss with other ingredients. Empty onto a serving plate, and toss with toasted pepita seeds. Serve. Leftovers will keep in the refrigerator for up to 3 days.